On 24 March 2018, millions of people across the world will again be going “lights out” for 60 minutes as they take part in the World Wide Fund for Nature’s (WWF) Earth Hour. Deutsche Hospitality will also once more be showing its support for the environment by sending out strong signals. The group’s Corporate Office in Frankfurt and a number of hotels in Germany, Switzerland, Belgium, Egypt, Dubai and Oman will all be part of the campaign. On the day of the event, the external facade lighting of the hotels involved will be switched off for an hour. Lights will be dimmed inside the buildings, and in some cases whole rooms will be illuminated by candle only. 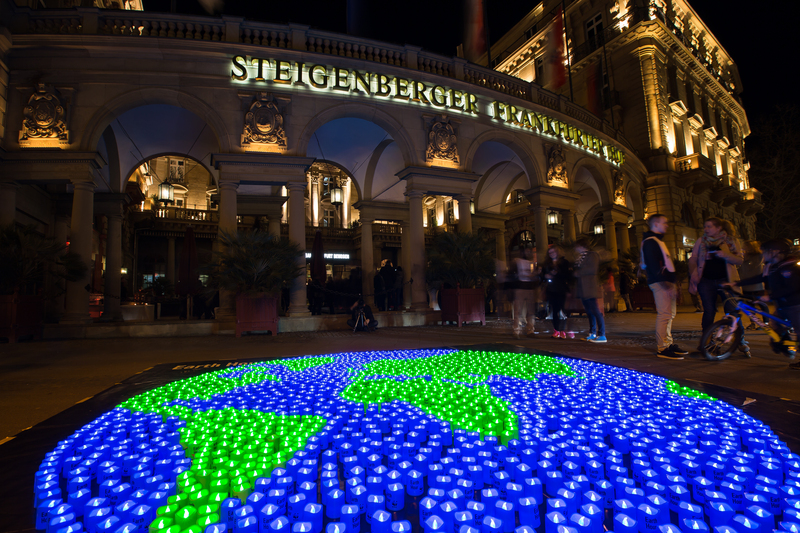 The Steigenberger Frankfurter Hof is joining forces with Frankfurt City Council to stage an Earth Hour Party, at which visitors will create their own light by taking to a special dance floor which is set on springs and able to generate its own electricity. The more movement produced by the dancers, the brighter the light will be. The IntercityHotel Mannheim will be raising money for the WWF via ideas such as the sale of “Earth Hour cocktails” and regional specialities. The Steigenberger Grandhotel Belvédère in Davos and the Steigenberger Hotel Bad Neuenahr will also be placing the emphasis on local produce, whilst the Steigenberger Graf Zeppelin will mark Earth Hour by giving seaweed a prominent place on its menu. Seaweed grows ten times faster than other plants and is therefore considered to be a particularly environmentally friendly foodstuff. The participating hotels are already drawing the attention of their guests to the campaign and raising awareness for climate protection by highlighting the topic on their respective websites and placing information sheets in rooms. The experiences of previous years have shown that guests very much enjoy being involved in making major gestures for the environment. Sustainability is a fundamental priority for Deutsche Hospitality. A new Corporate Social Responsibility Staff Department was established at Corporate Office at the start of this year with a view to continuing to pursue the ongoing development of this issue in a robust way. The use of electricity from renewable sources in all German lease hotels has allowed the company to bring about a significant improvement in its energy mix. Deutsche Hospitality also recently became a member of the International Tourism Partnership (ITP), where it is working in conjunction with a further twelve hotel groups to drive forward the topic of sustainability. The work of the ITP is based on the UN targets for sustainable development in the fields of CO2 emissions, water use, human rights and youth unemployment. This entry was posted in Festivals and Events, Hospitality, Hotels, Travel, Travel & Environment, Travel Management, Travel Services, Travelers and tagged Deutsche Hospitality, Earth Hour, World Wide Fund for Nature. Bookmark the permalink.